I've replaced a number of switches in my house following the Lutron instructions, but the wiring below is not covered. My question is: on my new Lutron switch (one is already visible in the picture), would I cap wires "A" and "B" together with the black wire on the Lutron switch to be installed? To make wiring easier, could I just cap wire B into group C? Also, this is a new house (just built four months ago). Is this a standard way to wire a house? A and B are already connected. The switch in the photo provides both backstab and screw connections which are internally connected within the switch. The builder prefers backstab connections (because they're faster; their poor reliability isn't his problem), and when he needed a second connection he used the screw also. It looks like A is a pigtail from the wirenut to the switch. I imagine that before, it was a jumper to the other switch, but then, you added that smart switch, which necessitated a pigtail. Given the presence of the pigtail, sending B to the switch is stupid. B should immediately be pried out of the switch and added to wirenut C.
From there, if you are replacing that switch with another smart switch, I imagine A will be replaced by the smart switch's pigtail. To help you lose your mind less in that box, look at the wire that attaches to the left smart switch's red wire; I would tag that with red tape. The right wire on the right switch, I would tag that with blue tape. They are both switched-hots going to a light or fan. Remember you must never, ever put a dimmer on a fan or receptacle! Check all your receptacles and make sure they are not switched by any of these switches (this is a common "feature" in newer homes). If you really, really want to do that, there are a couple of technical solutions. It looks like wire B is your hot lead. 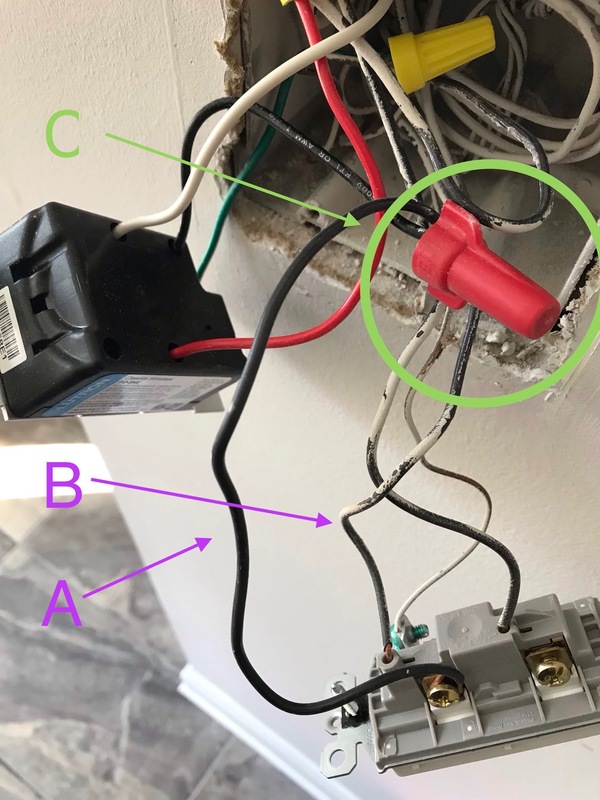 Wire B is internally connected in the switch to the terminal of wire A, which then caries hot to the new switch through connection C.
If this is correct, as you suggested, the simplest connection is attaching both Lutron black wires to wire B. Adding B to the C group would not be simpler, since you would then need to join the other end of the A wire to the new Lutron black lead. Two wire nuts instead of one. Cut the B wire off the gray switch and tie that to the black wire from the existing dimmer and the black wire off the new dimmer and you're golden. The A wire wrapped around the screw can get thrown out with the switch. The other black wire on your gray switch switch will get thrown away with the switch. As the first post says. You wont be putting a dimmer on a fan motor or switched outlet. As you already know. You had a cheap and lazy electrician wire up that switch bank. Not the answer you're looking for? Browse other questions tagged electrical wiring smart-switch or ask your own question. 3-Way Light Switch, two blacks and a red? which wires to connect when installing a dimmer switch? Changing out programmable Light Switch, wire help needed! How should ground wires be handled when updating switch loops in an older home?